Natural deworming for puppies can help get rid of the most common worms which puppies often have, including roundworms, tapeworms, hookworms and whipworms. While a mild worm problem isn't likely to cause too much trouble, but unless it's treated effectively that mild problem can turn into a severe infestation very quickly... and that WILL mean trouble for little Rascal because some puppy worms can cause very serious health issues, and even have the potential to be fatal. There are many puppy worm medicines which your veterinarian can prescribe or recommend, and these are effective, but, the active ingredients are strong chemicals and these can cause unwanted side-effects and have their own dangers. Natural puppy deworming products and home remedies for puppy worms are chemical free and are generally safer, more gentle and have few (if any) side effects. But it's important to realize that just because something is natural, that doesn't mean it's necessarily safe or that you can't overdose or cause damage by using it incorrectly! If a puppy has worms he will often show certain symptoms, but not always. Also, some types of worms are NOT going to be noticeable in his poop, or visible to the naked eye. The only way to know for sure if your puppy has worms, and of what type, is to have your veterinarian test a sample of his stools. It's vital to do this regardless of the treatment route you want to take because not all deworming medicines, remedies or natural products are effective against all types of dog worms. Because a severe worm infestation is so dangerous, if your Rascal is diagnosed as having one, personally I would suggest initially giving him a vet-prescribed puppy deworming medicine as recommended by your veterinarian because you need to treat the problem quickly. Once you have the severity under control then the choice to use alternative deworming becomes a viable option. For a mild case of puppy worms, natural products and remedies can be both safe and effective, when used properly. There are several herbs which have proven to be effective anti-parasitics and can kill, expel and prevent worm infestations. However, just because a product is natural, it doesn't necessarily mean that it doesn't have some potential side effects or that it can't be toxic if it's not used correctly, or the dosage is wrong. Goldenseal tincture can be used to kill tapeworms and the single-cell parasites which cause Giardia. The usual recommended dosage is 5 - 10 drops per 10lb of your pup's bodyweight. Goldenseal is at it's most effective if you also give your dog garlic at the same time. Wormwood and Black Walnut tinctures are effective for killing most types of intestinal worms, and even heartworms, BUT they can be hard on the liver and/or kidneys and toxic in large quantities. It's vital to give the right dosage to prevent side effects or toxicity and I wouldn't recommend using either of them without first checking with a holistic veterinarian for dosing instructions. It's also important to support your puppy's immune system and give Milk Thistle at the same time (to help protect liver function). It can be easier, and safer, to use a natural herbal deworming product which has been specifically formulated for puppies and dogs rather than the individual herbs themselves. Eating certain foods can work as a natural method of deworming puppies. This route isn't one I'd recommend taking if your puppy has a moderate to severe worm infestation, but for a mild issue, or as a preventative measure, these foods can expel worms, boost Rascal's immune system and soothe his digestive tract. Choose organic, non-GMO options whenever possible to avoid chemicals/pesticides/hormones etc. Dietary additions like this work in different ways, some will expel adult worms, others can kill eggs or larvae, some may do both. They're not all effective for all types of worms. This is also not a one-time deal, dietary changes need to continue for several weeks as the worm population will then be reduced over time. After the worms are gone, maintaining a healthy immune-boosting diet which includes anti-parasitic foods as a preventative measure is important in keeping little Rascal healthy and worm free. Adding raw carrots to your dog's diet can help remove intestinal worms such as roundworms. Their rough texture helps to remove mucus and gently abrade the lining of little Rascal's intestines, dislodging worms and moving them out of his body. Raw carrots and carrot juice also kills worm eggs. Either chop or coarsely grate the carrots to add to your little Rascal's food. 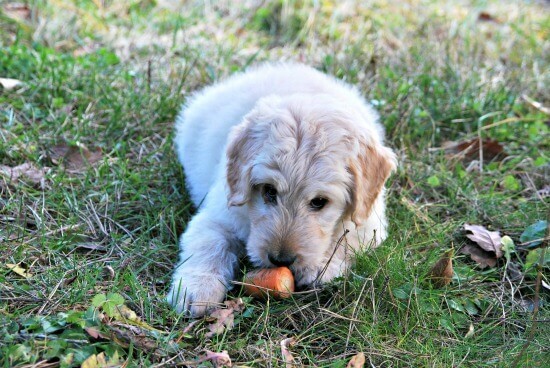 Puppies often like a chunk of carrot to chew on, but watch carefully to make sure he doesn't try to swallow it whole and choke. A couple of tablespoons of grated carrot, or a quarter cup of raw, chopped carrot twice a day is a good place to start. Raw garlic can kill intestinal worms, including hookworms, and is also effective against the single-cell parasites which cause Giardia. To give garlic to your dog, chop/mince/crush fresh garlic cloves and let it sit at room temperature for at least 10 minutes before adding to his food. This will maximize it's effectiveness as an anti-parasitic. One garlic clover per 30lbs of body weight per day is a good dosage to start with. Bear in mind that in large doses raw garlic can cause digestive upset or even be toxic to dogs, so don't overdo it! Mixing a little raw chopped Fennel with the garlic will give it an additional boost and is especially good for Rascal's immune system. Turmeric contains Curcumin which is a natural anti-parasitic and can be effective against puppy worms including tapeworms and hookworms. It's also has anti-inflammatory properties and can helps soothe and heal the digestive tract from the damage done by worms. You can give Rascal approx. 1/4 tsp of ground turmeric per 10 lbs of body weight added to his food per day. (* Turmeric shouldn't be given to pregnant dogs as it could possibly stimulate contractions/labor. It can also thin the blood so don't give to a puppy or dog who is anemic, awaiting surgery, or on blood thinners). Pumpkin seeds (also known as Pepitas) contain Cucurbitin which can eliminate tapeworms and hookworms by paralyzing them, then they're naturally passed out of his body by the digestive system. 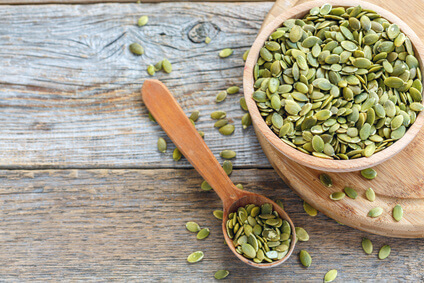 Choose raw, organic pumpkin seeds and crush or grind them into a powder. Add this powder to your pup's food, giving him 1/4 - 1/2 tsp per 10lbs of bodyweight per day. It's important to also give him Pumpkin Seed Oil or Wheatgerm Oil at the same time. Dosage for the oil is 1/4 tsp (1.25ml) of each per 10 lbs of body weight daily. Grapefruit seeds are effective for treating parasites as well as being anti-bacterial, anti-fungal and anti-viral. The active ingredients in the seeds are also potent immune system boosters. You can pulverize grapefruit seeds or give a liquid grapefruit seed extract. The simplest way to give your pup the benefits of grapefruit seeds is to add grapefruit seed extract to his meals. Dosage can fall anywhere between 1 drop per 5 lbs of body weight to a maximum of 10 drops per 10 lbs of body weight, up to a maximum of three times per day. Parsley is a herb which can be made into a tea which has anti-parasitic properties. So simple to do. Just add a bunch of fresh, organic parsley to a quart of boiling water, reduce heat and let it simmer for about 15 minutes then allow to cool naturally. Remove the parsley and pour water into a clean jar or jug and store in the refrigerator. Give your puppy 1/4 cup of parsley water per 10 lbs of body weight once or twice a day added to his drinking water or poured over his food. Coconut Oil can be used to help eliminate roundworms, tapeworms and even giardia parasites in your puppy's digestive system. Choose organic, virgin coconut oil and add it to Rascal's food daily. Too much coconut oil can cause loose stools so start slowly with approx. 1/4 tsp daily and build up to 1tsp per 10 lbs of bodyweight as your puppy's tolerance for it increases. Coconut Oil also helps to maintain a healthy balance of gut flora, heals damage to the intestines and is anti-bacterial, anti-viral and anti-fungal. It's most effective as a natural deworming option for puppies when used in conjunction with other naturally anti-parasitic foods. Food-grade Diamatoceous Earth is a popular option when it comes to natural deworming for puppies and is effective against roundworms, tapeworms, hookworms and whipworms and lungworms. Diamotaceous Earth is a fine white powder, made from crushed shells of microscopic aquatic creatures called Diatoms. It's essential to only use FOOD GRADE Diamotaceous Earth as a natural parasitic. If possible get DE which has been fresh-water sourced. There is an alternative type of DE which is used for pool cleaning and in manufacturing processes, but this is not safe for animal (or human) use. Diamotaceous Earthworks in a very basic way, by being both abrasive and moisture-absorbing. The microscopic shell particles damage the out body of parasites, and then absorb their moisture, basically killing them by dehydration. Food grade DE is totally safe for little Rascal to ingest and I'd recommend starting out by adding it to his meals at 1 tsp per 25 lbs of body weight. A minimum of 30 days treatment is needed because only adult worms will be killed so all larvae and eggs in your puppy's body will need to have time to mature before being killed. For tapeworms: double the above recommended dosage and treatment period. For lungworms, or hookworms: which have migrated through your pup's body and entered his lungs, double that recommended dosage and triple the treatment period to at least 90 days. Diamotaceous Earth can be used year-round as a worm preventative without any side effects. Although some intestinal worms are almost inescapable for very young puppies, they are much less likely to inhabit, and thrive, in a healthy puppy who's digestive system is working optimally. Making sure your little Rascal eats a healthy and natural diet, that his living environment is clean and well-maintained and that he gets what he needs to be physically and mentally strong are all things which play a role in keeping him well and parasite free. Keeping your puppy's digestive and immune systems strong is also very important, and in addition to the basics above, there are several natural ways to give these areas a little boost. 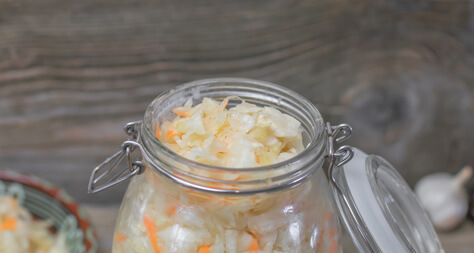 Feeding your puppy fermented foods improves both digestive and immune function because they're packed full of probiotics and healthy bacteria, they remove toxins (and parasites) from the body naturally and are very nutrient dense. Puppy worms and other intestinal parasites find it much more difficult to thrive in a healthy digestive system and the majority of the immune system is based in the gut too... so keeping the gut in tip-top shape is doubly important. Adding fermented foods to Rascal's diet regularly will help to make his digestive system an inhospitable place for worms and discourage them from sticking around. * You can ferment lots of different types of vegetables, but the most commonly used ones include cabbage, broccoli, carrots, celery, kale and radishes. You don't want to add too many fermented veggies to your puppy's diet at once as it could cause tummy upset, you also don't need a lot to be effective. A suggested starting point would be approx. 2 tsp of fermented vegetables per 20 lbs of a dog/puppy's body weight, but 1 tsp is also fine if you want to start out even more slowly. If you're interested in finding out more about how to ferment vegetables naturally for your puppy, check out this video. Bone broth is literally a superfood for dogs and puppies. It's especially very young pups, senior dogs, and pups/dogs of any age who are recovering from illness or need a health boost. As part of a natural deworming for puppies protocol, bone broth can definitely help by supporting little Rascal's immune system and providing an easily digestive source of high-quality nutrition (in a very tasty package). It's naturally anti-inflammatory so can help soothe and heal the gut after a parasitic infection and is rich in vitamins and minerals. There are a range of natural supplements designed specifically to boost immune function or to support a healthy digestive system. Giving one of these to your puppy regularly can discourage worm infestation by keeping his gut and immune system strong and inhospitable to parasites.